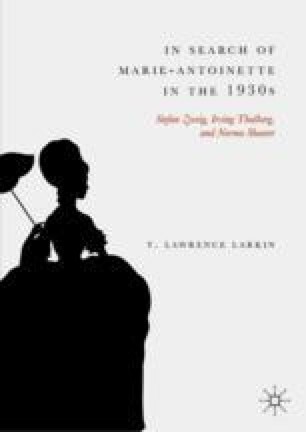 The book closes with a summation of the divergent interests Zweig, Thalberg, and Shearer brought to bear in the creation of a myth about “Marie-Antoinette” in the German states and the United States in the 1930s that ultimately compromised an “objective” or “authentic” appreciation of the historical queen. All three creative agents certainly anticipated that historical content would be central to advancing a research plan, establishing a creditable mythical character, and making the product appeal to the public, but the pressures of current trends, standards, and conventions affected the outcome. Erwin Rieger’s assemblage of empirical data was no match for Zweig’s devotion to the psychoanalytic method; the studio research department’s audit of the screenplay had to bow before Thalberg’s instinct for a dramatic angle; and the studio head’s equation of glamor and profits was met by Shearer’s desire to realize an independent point of view. All three agents managed to achieve a balance between referencing the past and advancing a narrative, though each had a decidedly different message for the modern woman.